Built in 1998 by the Kichwa Añangu community, the Napo Wildlife Centre has come a long way since its humble beginnings 20 years ago. The Kichwa community’s approach to eco tourism and dedication to the preservation of the environment are just two of many reasons why this incredible lodge has been so successful and continues to be a pioneer in eco-tourism and conservation. Perched on a small ridge along the banks of the beautiful lake Añangu, Napo Wildlife Centre is ideally located within the Amazon rainforest. Situated within Ecuador’s UNESCO Biosphere reserve, Yasuni National Park, the lodge overlooks the 2.5 million acres of the lush Amazon Jungle. Yasuni National Park is home to the Kichwa people who have inhabited the area for over 500 years. Your stay at Napa Wildlife Centre is only heightened with the expertise and insights of the Kichwa community who share their knowledge as well as open your eyes to the hidden secrets of the Amazon. A vast ecosystem of spectacular creatures; the Amazon is a nature lovers paradise offering incredibly unique birdlife and insects you cant find anywhere else. Furthermore, the wildlife, is astounding! You may be lucky enough to catch a glimpse of the elusive jaguar. Animals aside, the fauna of the Amazon is second to none; a biosphere of native plants creating a vibrant atmosphere of tall trees and colourful flowers. The lodge offers 12 standard cabins offering double or triple share sleeping arrangements. You can expect a luxurious blend of traditional native architecture coupled with modern facilities. 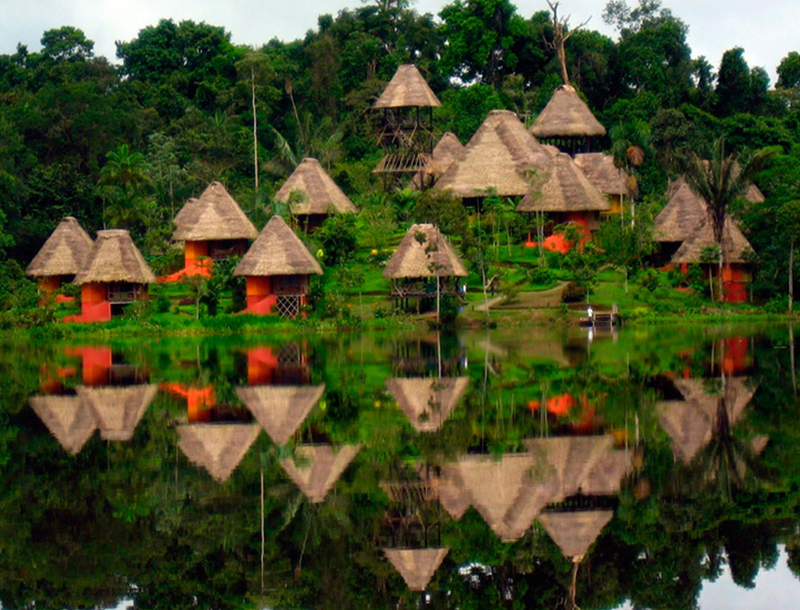 Each cabin provides guests with luxury in the heart of Ecuador’s Amazon Rainforest. Incredibly spacious, each cabin includes en suite bathrooms and a private balcony overlooking the picturesque Añangu lagoon. A collection of 8 suites made up of 4 connecting suites are perfect for families. The 4 brand new suites are ideally suited to couples and honeymooners. Each of the suites offers the same amenities and facilities as the standard cabins plus more. When you’re not outside, relax in the comfort of your own living room and watch the amazing amazon through panoramic windows. Luxury at its finest, all suites feature a private Jacuzzi with a remarkable view of the surrounding rainforest. Additionally, the 4 new suites have a panoramic glass floor in the living room. This feature is the first and only of it’s kind within the region. From the comforts of your living room, look out for caimans, hoatzins fluttering around, and if you’re lucky, hungry giant otters searching for piranhas in the lagoon. The Ecological Tower is a striking structure standing tall at 40 metres built entirely from natural materials, the tower is an impressive addition to the complex. The first couple of floors provide guests with comfortable living rooms, bars as well as a boutique to purchase gifts and souvenirs. The upper floors offer exceptional panoramic views of the amazon from high up. Relax while dining on wonderful food, witnessing the many species of plant and animal life of the National Park. A true spectacle to behold, the clay licks are a magnet for a diverse array of birds all feeding on the rich minerals of the natural licks. Wake up early in the morning to witness the spectacle in full effect with hundreds of birds creating a rainbow of vibrant colours across the dull clay licks. Here, you can find parrot species that are unique to the Ecuadorian Amazon; making this experience even more magical. A highlight of the Amazon is without a doubt the walks through the incredible forest. The chance to participate in walks and hikes through the jungle provide opportunity to witness the vast array of wildlife. You can expect to see anacondas, spiders, giant armadillo, and birds such as hoatzins, macaws, toucans, parakeets, parrots as well as monkeys, tapirs, ocelots and so much more. Explore the backwaters of the Añangu lagoon as well as the surrounding rivers and creeks of the Amazon. On board either a motorised or paddle canoe you can explore the Amazon. Travel through interconnecting lakes and witness an abundance of sea life including caimans, turtles, giant otters and so much more. A truly unique experience to the Napo Wildlife Centre is the Interpretive Centre. It is here that you can experience a truly immersive cultural experience with the Kichwa Añangu Community. You are welcomed with traditional dances, rituals, handcrafts as well as native food and drinks. Furthermore a real highlight of the Centre is learning from the Kichwa Añangu Community; listen to ancient stories of their heritage as well as learn about the projects they’ve created as livelihoods for their community. A stay at the Napo Wildlife Centre is unparalleled. The expertise and knowledge of the local guides and the staff adds an extraordinary dimension to your amazon experience. So, don’t wait any longer; go on the adventure of a lifetime in the amazing Amazon and stay at the exceptional Napo Wildlife Centre.